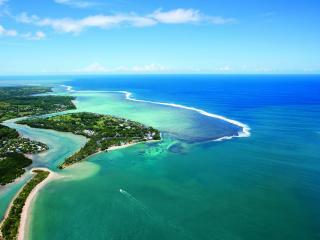 The Shangri-La Fijian Resort & Spa is situated on its own private 109 acre and island and is conveniently connected to the main island by a causeway. 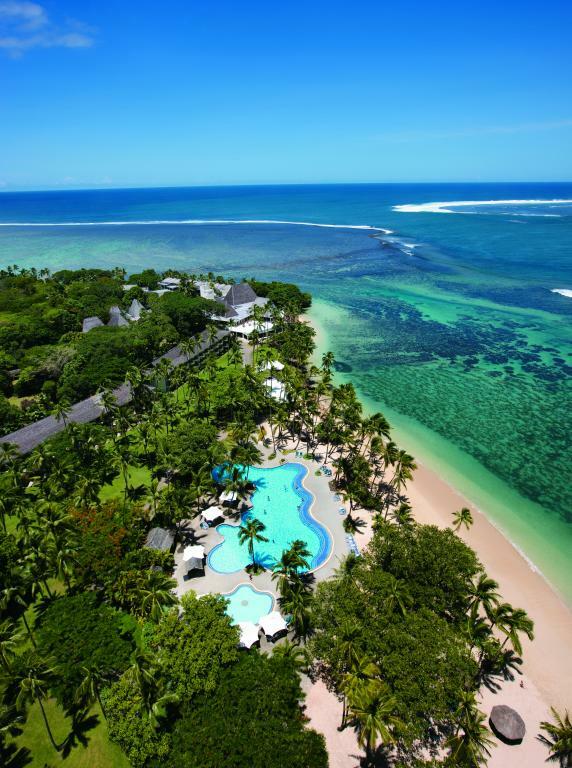 The Shangri-La Fiji Resort offers a pristine blue lagoon teeming with coral and sea life, palm-fringed white sand beaches, tropical gardens and magnificent ocean views. The layout of the resort is inspired by a traditional Fijian village providing guests with the relaxing atmosphere of the South Pacific. 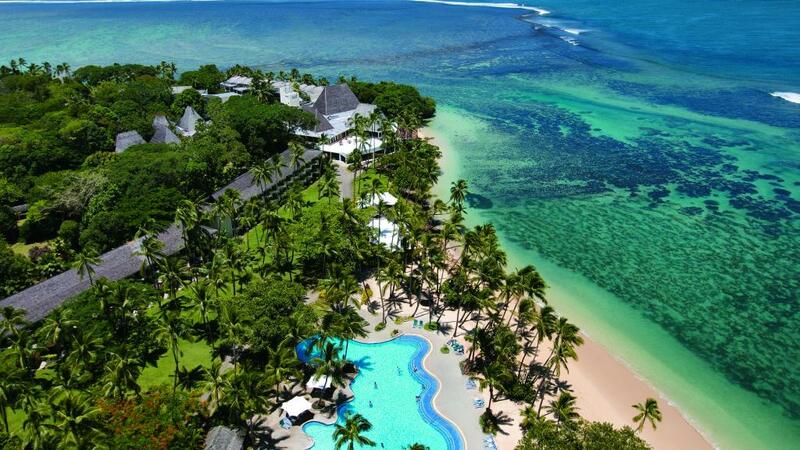 Shangri-La Fijian Resort & Spa, only a 1 hour drive from Nadi International Airport is located on the beautiful Coral Coast of Fiji's main island Viti Levu. 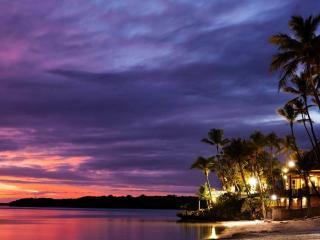 Fiji's complete holiday resort, affordable and offering a host of facilities and activities few can match. Activities at the resort include banana boat rides, jet skiing, kayaking and snorkeling. For kids, the resort offers the Little Chief's Kids Club, Waterpark, children's pool and play areas making the Shangri La Fijian Resort ideal for family holidays. 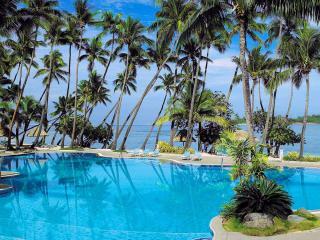 The Shangri-La Fijian Resort and Spa also features one of the largest and most luxurious spas in Fiji, called CHI. The Chi Spa at Shangri-La Fijian Resort includes two rainforest bures and four ocean treatment bures. The Chi Spa is an ideal retreat for adults looking for the ultimate in holiday relaxation. Shangri-La's Fijian Resort and Spa's 442 guest rooms each have their own private balcony overlooking the lagoon or Pacific Ocean. Please note: Cots are available at no additional charge. An infant is included in the children count for maximum room capacity. Available in all room categories excluding Reef Wing Rooms. Interconnecting Rooms: Can be requested at time of booking and are subject to availability and can only be requested for Yanuca Lagoon Grand Deluxe, Ocean Deluxe King, Ocean Deluxe Twin & Ocean Grand Deluxe categories. All Deluxe Rooms are located on top floors. All Terrace Rooms are located on the ground floors. All Grand rooms are family rooms & located mostly on the ground floors. Yanuca Lagoon Deluxe: Located on the top floor. Great for families. No inter-connecting rooms available. Offer private balconies with views over the resort's lagoon. Some rooms have a shower over the bathtub. Size is 32m². Bedding is 1 King Bed + 1 Sofa + Daybed with pull out Trundle (Trundle can sleep 1 child 6 years and under only). No extra bed. Maximum room capacity is 3 Adults OR 2 Adults & 2 Children. Please see your consultant if you require a quote for 2 Adults + 2 Children. Yanuca Lagoon Terrace: Located on the ground floor. Great for families. No inter-connecting rooms available. Same layout as the Lagoon Deluxe except located on the ground floor. Overlooks the private lagoon offering direct access to the Lagoon Pool and beach area. Size of room is 32m². Bedding is 1 King Bed + 1 Sofa + Daybed with pull out Trundle (Trundle can sleep 1 child 6 years and under only). No extra bed. Maximum room capacity is 3 Adults OR 2 Adults & 2 Children. Please see your consultant if you require a quote for 2 Adults + 2 Children. Yanuca Lagoon Grand Deluxe: 98% of these rooms are located on the ground floor with direct entry to the garden, with the rest on the top floor. Great for families. Overlooks the lagoon and pool. Features a curtain divider. Size of room is 37m². Bedding is 1 King Bed + 1 Sofa with Trundle Bed / Or 1 Single Bed. Maximum room capacity is 3 Adults OR 2 Adults & 2 Children. Trundle can only sleep children (0- 6 years). A baby cot can be placed in this room type and is included in the count for maximum number of children. Yanuca Lagoon Suite: Lagoon Views. Great for Families. No inter-connecting rooms available. This 1 Bedroom suite has a separate living room and a spacious private balcony with small daybed & dining table. There is a sliding partition door from the lounge room to the bedroom. Size is 67m². Bedding is 1 King Bed + 2 pullout Sofa beds + 1 Single Bed. Maximum room capacity is 2 Adults & 3 Children OR 3 Adults. Note: A baby cot can be placed in this room type and is included in the count for maximum number of children. Yanuca Lagoon Bure: Featuring ocean views, these 2 bedroom suites offer separate living and dining areas, decorated in traditional Fijian style. No inter-connecting rooms available. Size is 106m². Bedding is 1 King Bed + 2 Double Beds. No Extra Beds. Maximum room capacity is 4 Adults OR 2 Adults & 4 Children. Note: A baby cot can be placed in this room type and is included in the count for maximum number of children. Ocean Deluxe King: Located in the Ocean Wing. Great for families. Features ocean views from the private balcony. Size is 36m². Bedding is 1 King Bed + 1 Pull-out Sofa Bed. No Extra Beds. Maximum room capacity is 3 Adults OR 2 Adults & 2 Children. Note: A baby cot can be placed in this room type and is included in the count for maximum number of children. Ocean Deluxe Twin: Located in the Ocean Wing. Great for families. Features ocean views from the private balcony. Size is 36m². Bedding is 2 Double Beds. No Extra Beds. Maximum room capacity is 3 Adults OR 2 Adults & 2 Children. Note: A baby cot can be placed in this room type and is included in the count for maximum number of children. Ocean Terrace: Located on the ground floor in the Ocean Wing. Direct access to the lawn from the private terrace. No inter-connecting rooms available. Size is 36m². Bedding is 1 King Bed + 1 Pull-out Sofa Bed OR 2 Double Beds. No Extra Beds. Maximum room capacity is 3 Adults or 2 Adults + 2 Children. Note: A baby cot can be placed in this room type and is included in the count for maximum number of children. Ocean Grand Deluxe: Features panoramic ocean views from the private balcony. Size is 43m². Bedding is 1 King Bed + 2 Divans (size 193cm x 91cm and suitable for all guests.). Plus can request 1 additional Single Bed. Maximum room capacity is 3 Adults OR 2 Adults & 3 Children. Note: A baby cot can be placed in this room type and is included in the count for maximum number of children. Welcome adults (17 years and above). Reef rooms are located in a quieter, more private end of the resort. Reef Deluxe King: Adults only (17 years and above). Features ocean views from the private balcony. Size is 36m². Bedding is 1 King Bed. Maximum capacity is 3 Adults. Reef Deluxe Twin: Adults only (17 years and above). Features ocean views from the private balcony. Size is 36m². Bedding is 2 Double Beds. Maximum capacity is 2 Adults. Reef Grand Deluxe: Adults only (17 years and above). Located on the ground floor. Size is 43m². Bedding is 1 King Bed. Maximum capacity is 3 Adults. Reef Suite: Adults only (17 years and above). Features a separate living area, private balcony and ocean views. Size is 67m². Bedding is 1 King Bed. Maximum capacity is 3 Adults. Reef Bure: Adults only (17 years and above). Set on the water's edge this beautiful Fijian bure offers views over the ocean and lagoon. This suite has a separate living area and dedicated golf buggy for duration of stay. Size is 136m². Bedding is 1 King Bed. Maximum capacity is 2 Adults. Beach Bar & Grill: Open for lunch and dinner, this is the perfect place to relax on the beachfront and take in the lush landscaped lagoon area while enjoying light meals, salads, sandwiches and grills. Cafe Coral: Welcomes guests 16 years and over, open daily for lunch. Golden Cowrie Coastal Italian: Open for guests 16 years and over for breakfast and all-ages for dinner. Enjoy a great variety of Italian classics whilst enjoying stunning views of the lagoon. Golden Cowrie Lounge: Open daily, welcomes guests 16 years and older, offering cocktails and drinks whilst overlooking the magnificent lagoon. Takali Restaurant: Great all day poolside dining. Open for breakfast, lunch and dinner, this casual dining venue specialises in Asian and seafood cuisine with panoramic views of the coral reefs on the edge of the Pacific Ocean. Yanuca Island Cafe: Open daily, offering snacks and coffee. Lagoon Terrace Restaurant: Overlooks the lagoon pool, offers casual dining. Bilo Bar: Set on the beachfront and offering an excellent selection of tropical cocktails, this is the best place to view the stunning sunsets. *Please note that restaurant programmes and opening hours may change from time to time, depending on seasons and resort occupancy. CHI, The Spa: Set away from the main resort, this secluded day spa features the luxury of the largest spa bures in Fiji complete with views of the Pacific Ocean or island rainforest, private garden patios, sunken tubs or Jacuzzi, herbal steam rooms and outdoor showers. Treatments are influenced by traditional Chinese and Himalayan techniques and are the perfect way to restore balance to both your body and mind. Surrender to the ultimate relaxation of Chi's signature treatments, expert therapists and the therapeutic scent of aromatic oils and fragrant herbs and spices. 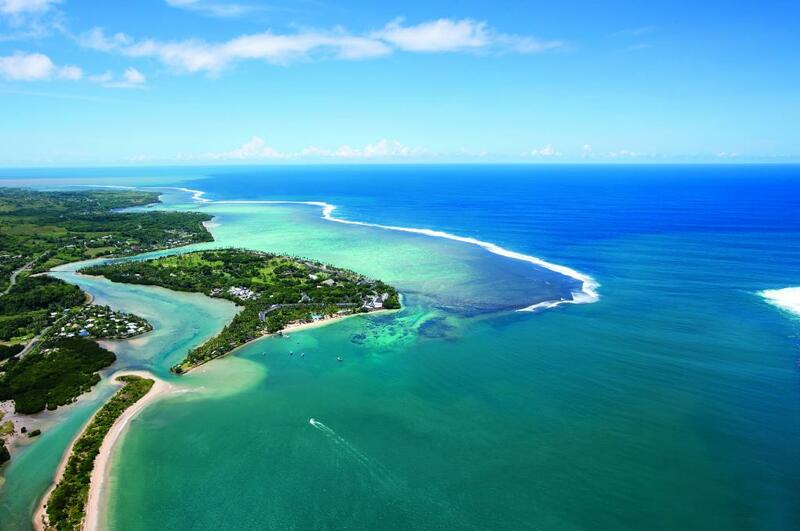 Shangri-La Fijian Resort features a Peter Thompson designed 9-hole executive golf course. Ideal for those guests who love a game of golf while on holidays or for the golf fanatic who needs their weekly game of golf. Free Kids Club: Open daily, kids aged 4 - 12 years will love the complementary Little Chief's Club. Activities are designed for two different age groups, 4 - 7 years and 8 - 12 years and during peak periods, an additional program operates for 13 - 17 year olds. A range of fun activities will keep the kid's busy while under the safety and supervision of the resort's friendly staff. Children 3 years and under need to be accompanied by an adult. A babysitting service is available for a small fee. Fijian babysitters are available at approximately F$24 for a minimum of 3 hours and F$7 per hour thereafter. A maximum of 3 children are permitted per babysitter. Prices subject to change. Shangri-La Fijian Resort offers an excellent Wedding Service, with a range of venues for outdoor weddings as well as the beautiful Seaside Wedding Chapel. The Chapel sits up to 40 guests and features a glass wall and ceiling at the altar with sweeping views of the reef and Pacific Ocean. Rewenal of Vows package is also available. Fijian Wedding Package: Includes Marriage License, escorted return transfers to the local registry, Minister/Celebrant, wedding venue set up - please press `instant quote` for full inclusion details or ask a consultant for further assistance. Seaside Wedding Chapel Package: Includes Marriage License, escorted return transfers to the local registry, Minister/Celebrant, wedding venue set up - please press `instant quote` for full inclusion details or ask a consultant for further assistance. Children: 2x Kids Stay Free 0-16 years when sharing the same room as the parents using existing bedding. 2x Kids Eat Free 0-12 years from the kids menu when dining with a paying adult. Infants: Infants can stay in a cot and are included in the maximum occupancy count for children.